Metalwerx is happy to announce another year of the Ornamental Peace Project. In the wake of a national tragedy, we often find ourselves questioning what is “peace” and how do we obtain it, and more importantly how can we maintain it? As community of jewelers and metalsmiths, Metalwerx invites you express these feelings through making. This year, we are excited to be collaborating with our project kit sponsor, Halstead! For just $25 you get everything you need to create an ornament: 2 pieces of copper, wire, chain, and some odds and ends (such as cut out doves, stars, etc). Your submission to this project gives back in more ways than one. 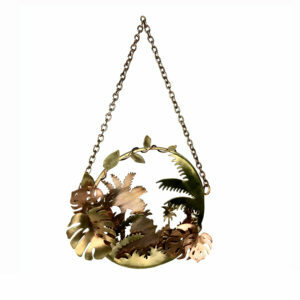 Your purchase of this kit helps fund Metalwerx, a non-profit 501(c)3 and if you choose to sell your ornament it will be on display at CraftBoston Holiday, where a lucky costumer can purchase your handmade item and help share peace for many years to come. When you support Metalwerx you are helping us ignite a passion for metals arts for every student that walks through our doors. All of the dollars we raise with this fundraiser will directly support our efforts to provide more programming to our community! So we ask all of our participants – what does PEACE mean to you? If you close your eyes right now and envision peace, what do you see? Let’s fight through some of the normal imagery that first pops into your mind. Look past the peace signs, the tie dye, and the frogs holding up the peace symbols…ok there we go, now what do you see? Is it a vacation by the lake, family gathered near, perhaps a voting box, or is it something more abstract, a feeling as opposed to something physical? How do we capture this feeling in the things we make? As said by Michael Good during his Pioneer in Metals Award speech “Craft does an amazing thing, it forces us to be in the moment”- so perhaps whatever you make whether it is literal or abstract is inherently peaceful, because you made it with your own two hands. 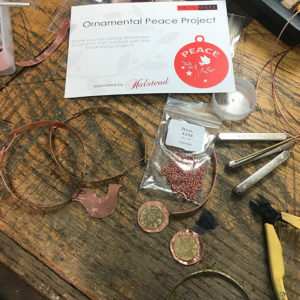 Help us share the peace; get your Ornamental Peace Project Kit today! 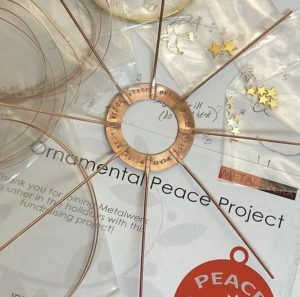 Join as in the Metalwerx Studio on Nov 12th and Nov 19th from 4:30-8pm, and Nov 20th 10am-4pm, for free open studio time to create your Ornamental Peace Project.